Want a quilted puzzle for your classroom? Here is an artistic rendition of uniform and accelerated motion, with blocks depicting x-t, v-t and a-t graphs. The elements of the graphs are calculated to be scientifically accurate using the equations of motion. 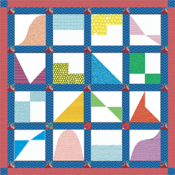 The pattern includes templates for rectangular and curved blocks, and detailed instructions. Download and get going! When you purchase the pattern you can either download the pattern when the receipt pops up on the screen, or from the confirmation email you receive. On sale during NSTA month (April 2019)!